Civic leaders in Ponteland are celebrating after securing a national quality standard for the fifth year running. Town and Parish Councils have to pass a series of stringent tests to attain Quality Status from the National Association of Local Councils. They include promotion of local democracy and citizenship, how they communicate and engage with residents, how they conduct council meetings, the management of accounts and annual reports and electoral arrangements. Out of more than 140 town and parish councils in Northumberland, Ponteland is one of only three to have achieved Quality Status. 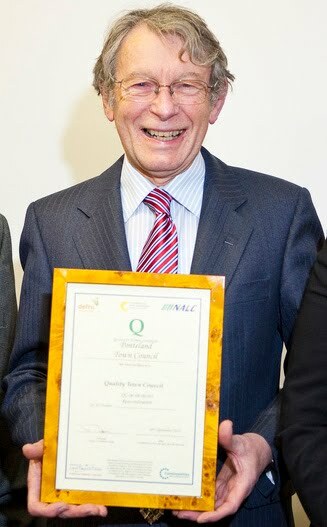 Town Mayor Robin Ramsay received the Council's Quality Status award from Norman Dunn, Chairman of the Accreditation Panel at the Northumberland Association of Local Councils, at the Town Council's monthly meeting on Wednesday night. Coun Ramsay said: "It is great to receive independent recognition that the Town Council is providing a quality service to people living and working in Ponteland parish. Both councillors and staff work very hard to serve the community and this is a richly deserved award." The authority submitted a portfolio of evidence to an NALC panel supporting the application for Quality Status reaccreditation and was interviewed in September.